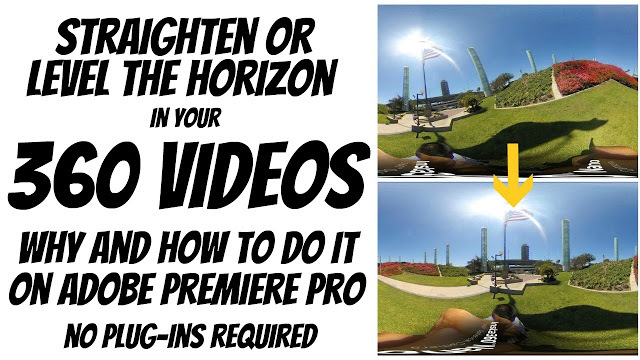 Here is a tutorial for leveling or straightening the horizon in your 360 video using Adobe Premiere Pro CC. This very short (3 minute video) tutorial doesn’t require a plug-in but does require Premiere Pro 2017.1. A 360 video needs to have a level horizon or else it will make it move unexpectedly when rotated, which can be confusing and disorienting for viewers. Because of this, many 360 cameras have vertical orientation sensors to automatically render the video rightside up. However, the orientation sensors usually don’t work perfectly, or sometimes works only for photos but not for videos. The result is often a tilted horizon in 360 videos. In this tutorial, I show how to correct / level / straighten the horizon using Adobe Premiere Pro CC. This tutorial requires that you upgrade your Premiere to 2017.1 or later. I hope you found this video helpful! Please take a moment to hit the like button (so that YouTube can show it to more people) and for more techniques and 360 camera info, please subscribe to 360 Rumors’ YouTube channel. Thank you very much! Due to your reviews, I bought a Xiaomi Mijia Sphere too… And it’s really awesome camera! Do you know a free app or Windows program to correct the horizon level on pictures too?